Broadliner Pinstriping Brushes series 40 by Andrew Mack Brush Company. These Broadliner Pinstriping Brushes series 40 are designed for large freehand Pinstripes and to fill in larger areas when pinstriping. Broad-liners are used for wide line graphics instead of a quill because they hold so much more paint for longer lines. Broadliner Pinstriping Brushes, Broad-liners are excellent Molding painting Brushes and have been adapted for broad lines and heavy coverage, the size depending upon the width of line desired. Also good for backing off moldings, chair and table legs, refrigerator bottoms, and other sectional areas in Restoration. Broadliner Pinstriping Brushes are great for painting on Gold Size Adhesive for Pinstriped Gold Leaf lines. They make great fill in brushes on wide graphics (can replace a quill or stroke brush). Used on the edge, each size makes a slightly narrower line than when used flat. These brushes are universal for touch-up, for background work, and for varnishing limited areas. Broadliner Pinstriping Brushes listed below! Broadliner Pinstriping Brushes series 40 are a excellent Touch-up brush. 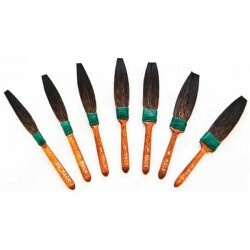 These Broadliner Pinstriping Brushes series 40 are made from European Dressed Squirrel Hair and are Lacquer, Enamel, Urethane and Water Resistant. All of the Broadliner Pinstriping Brushes series 40 are made in the USA. Broadliner Pinstriping Brush series-40 size 0 by Andrew Mack Brush Company. The Broadliner Pinstriping Brush series-40 size 0 are designed for large f..
Mack Brush Series 45 Size 6 Width of Head: 3/4" Lenght Out: 2"European Dressed Squirrel Hair. Made Lacquer, Enamel and Water resistant. &n..
Mack Brush Series 45 Size 7 Width of Head: 7/8" Length Out: 2"European Dressed Squirrel Hair. Made Lacquer, Enamel and Water resistant. &n..